I wanted to like this book I really did, after all I love America, I like train rides and the author quoted my very favourite Simon and Garfunkel song in the title. But ultimately I felt it was poorly researched, contained quite a few spelling mistakes/typos and left me feeling sorry for the author as he seemed to have a fairly large chip on his shoulder about America and the American lifestyle. As a fellow Brit I can understand the author's love for a beer or two but by the end of the book I felt like that all he did was lurch from pub to pub during his journey without ever trying to get to know the towns in which he was staying. The greatest asset of this book is that it was written by an Englishman. 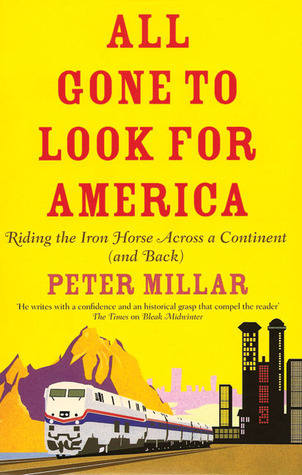 Armed with his experiences of efficient public transportation and compact walkable cities from his homeland, Millar gives insightful commentary on the American cities he visits. Going beyond the simple observations that every American downtown is run-down and unwalkable (which are true), he points out simple American oddities that can only be noticed by a foreigner. Of course, as an Englishman, he tends to enjoy American food and drink. An interesting account of the authors travels by train around the United States. His witty and sometimes hilarious comments reminded me of Bill Bryson's view of the English in 'Notes from a Small Island' He did seem to have a bit of a chip on his shoulder regarding his view of America and Americans and this was negatively reflected in his writing.Not one of my favorite travel books compared to Bill Bryson or Paul Theroux. He did seem to find solace in the form of a good micro-brew. I had high hopes but felt that the author lost his way a bit. It seemed as though he got bored with the trip, as happens in many travel books I feel. Struggled to stay positive and finish it. PS-Buffalo is an amazing city, as I'd imagine most of the other cities he didn't speak to highly off are. Sometimes you just have to give a place a chance-a little more than 24 hours would help! Some good descriptive writing and interesting facts and history I never knew as he writes of his journey around America by train. I wasn't so keen on the micro brewery visits which he sought out in the cities he visited as I much prefer cold American "beer" to the warm English stuff but that definitely puts me in a minority in England. Not bad but lacks the humour of Bill Bryson. Would I read anything else by him, probably not. Think there are better travel writers out there. Hoped for so much more.